Our most popular Christmas gift (and a steady favorite throughout the year) is our Man Cave Plaque Personalized. This old-fashioned wooden plaque features the name of your choice silkscreened by hand onto the top of the wood sign, and boasts a 3-dimensional cast relief of a beer mug overflowing with froth. 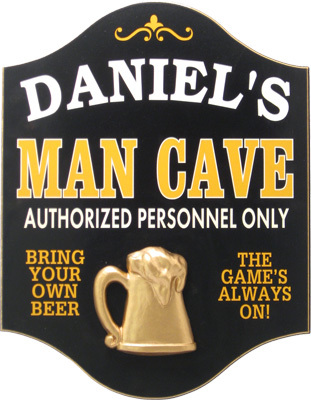 Designed in a classic pub sign shape, and featuring pertinent man cave info (Authorized Personnel Only, BYOB, The Game's Always On), this man cave wall decor sign is a great gift idea for any guy. Made in the USA from furniture grade wood. Routed edge. Gold, green, and yellow colors. Ready to hang. We'll ship this as a gift anywhere in the US, Canada, or even APOs! Also available as a non-personalized Official Man Cave Sign and an incredibly affordable Small Official Man Cave Sign. These items all thip in 2-5 business days. The perfect holiday gift idea for a football den, home bar, man room, or man cave!